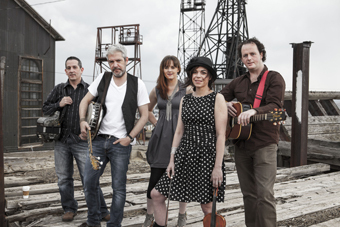 Join Solas, "Irish America's most influential band" (NPR's The Thistle and Shamrock) as they celebrate the release of Shamrock City, their 11th album and most ambitious project & live show to date. A family story of immigration, mining and murder, and the remarkable history of Michael Conway & Butte, MT, Kim Ruehl of FolkAlley.com calls it "a deeply thoughtful, imaginative collection of songs which grapple with the wealth of ideas and emotions inherent in the immigrant journey". Well-known as genre-crossers, special guests on the album include Rhiannon Giddens of GRAMMY Award winning old-time string trio Carolina Chocolate Drops & Aoife O'Donovan of nu-folk trailblazers Crooked Still. The Shamrock City live show, an interactive multi-media stage show that features stories from and projected images of Butte, is receiving rave reviews. Paul Keating, a longtime Irish music critic and founder of the Catskills Irish Art Week released this early review for IrishCentral.com: "Based on the performance this could be a landmark recording, and in some aspects it might very well be the best one they have ever done, which is saying something given the 'supernova' status of their early years." Julia Crowley of Eugene Weekly says their Shedd gig was "amazing, excellent, a fascinating story." About Shamrock City: In 1910, Solas band leader Seamus Egan's great-great uncle Michael Conway left his home in Co. Mayo, Ireland and boarded a ship for America. He was headed to the copper mines and boxing rings of Butte, Montana, aka Shamrock City (named so for the influx of Irish immigrants). Six years later, at the age of 25 and in a cloud of mystery, Michael was dead at the hands of local police. Shamrock City as seen through the eyes of Michael, tells the story of the thousands of young men and women who left behind their homes and families for "the Richest Hill on Earth". It reveals their spirit, tenacity and humor, but also the hardships they faced: discrimination, corruption within the mining companies, an unknown and unforgiving land, a system that valued the few over the many. One hundred years later, it's their story, but the struggles of the working class and immigrants are the same. Shamrock City is for those then and now that believe in a better life, and are willing to risk it all for a chance at something more.